Last Saturday’s Seize the Day rally in George Square was a day of positivity, hope and ambition; there were many speakers sharing their visions for the Left – for the future of Scotland – and the thousands strong crowd proved that the momentum that we built together throughout the referendum campaign is still thriving. Anyone who spent the day in the square will speak of the vibrancy that filled the air – the feeling that we were, together, stood on the brink of history. 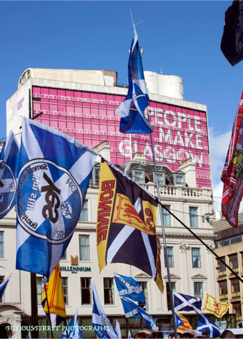 Of course it was not long until this vibrancy was replaced with negativity and the expected bombardment of adversity, from both social media and the national press, as a result of the involvement of one individual – Tommy Sheridan. Far from being portrayed as the diverse, inclusive event that it was; the usual report that it was a one man roadshow was recycled – an accusation promoted by outlets lacking any real understanding as to what went on behind the scenes and built purely on assumptions. A wide and varied collection of individuals and organisations played a pivotal role in the rally; The Indy Girls were there, the inspirational Lindsay Jarrett – Independence Climber – gave an impassioned speech, the Yes Bikers were a fantastic spectacle as they roared around the square, Storm Holytown secured the event and Loaves & Fishes again received copious amounts of food. Despite this, the credibility of the event was called into question, with suggestions that it was nothing more than a front for the Solidarity Party. As two people who sit on the organising committee, that was democratically elected in January, we know that this could not be further removed from the truth. Tommy has no role on the committee – it is filled with people from more than one political party – indeed, we are both SNP members. The only two meetings that Tommy attended were those that were open to non-committee members: one when the committee was formed, and one three days before the rally. He was invited as a compere and speaker, and had no input in committee business. As for the both of us, we have allegiance to no one; no politician, no party, no organisation, no splinter group, no activist, no sect – our loyalty lies in the fight for independence. At our first committee meeting it was agreed that all other independence supporting groups would be approached with the intention of uniting for one day to ensure that everyone could be represented – and, most importantly, that those who were attending the rally could hear all views from across the political spectrum. We personally reached out to several well known organisations and individuals; only one accepted our invite – Robin McAlpine. The opportunity to deliver a message was taken – and why shouldn’t it be? Aside from an SNP or Sturgeon endorsed event, Hope Over Fear has consistently had a massive pull, and the momentum that it helps to maintain should not be dismissed. We are open to working with any of the organisations that arose throughout the referendum campaign; we are not asking you to stand under our banner indefinitely – we are not trying to swallow you up and take any sort of illustrious shine from you. We are asking simply that, in the intermediate – at least – barriers be dismantled and we stand together in a collective display of strength. Hope Over Fear is not the shady band of deviants that the press and Leftist blogs try to portray us as. We do not rally around Tommy Sheridan and scream “Solidarity!”. Just like you, we are politicised individuals with opinions, views, ambitions and hopes for what our country can be. Some are mothers, fathers, grandmothers. We have individuals with impairments who dedicate time to working with us. Yet, some members of our committee fear releasing their names as a result of the storm of negativity that is sent our way. Is this what characterises the Left now? Perhaps if we could see past Saturday’s rally as the alleged one man show that particular blogs and the mainstream media like to emphasise – and instead comprehend that those thousands of people who congregated in George Square were not there out of loyalty to Hope Over Fear, Tommy or the SNP; rather, they were there to uphold an idea: independence. They were there because they have a vision of a better Scotland and they gathered in that square to feel the momentum, unity and collectiveness that we all created throughout the referendum campaign. Should Robin choose to provide his voice to such an audience – then that is his prerogative. Should he be ostracised, penalised and have his own work blackened for sharing a message of hope? How can we all preach radical political advancement yet indulge so viciously in cattiness? From our perspective, it is clear that the Scottish left is very fragmented to the point where any collective progress is now threatened. The referendum sparked a brand new political situation in our country; new activists and fresh voices were thrown into the mix and we stormed into the arena with our own ideas. We all speak of a “united Left”, “a strong collective force” – yet many continue to perpetuate and recycle old drama – the irony being that the progressive Left itself is standing in the way of progress. The principles of the Left wing movement have become very much lost in translation – what happened to unison, collectivity and consensus? The role of the wounded party is one that many seem keen to play, whilst ultimately failing to realise that those who are truly affected by this current schism are not those who are bruised by the past, nor those who spent this weekend vilifying Robin – but rather those of us who find ourselves embroiled in this antiquated battle. On Saturday there were many first time speakers sharing their visions for the Left, and for the future of Scotland; we have both been in that position also. Why should young, new activists with no allegiance nor links to any past occurrences feel pressured to justify why they took a platform? There is an old guard that is determined to play a prominent role within this new movement and, due to the wave of fresh blood that has washed into our political arena, this would be welcomed. We can learn from you – we want to learn from you – however, we do not want to drown in a sea of acrimony. We need to be able to involve ourselves in events, rallies, demonstrations; we need to be able to work with people who hold political experience and we need to be allowed to find our way through the Scottish political sphere without being tarnished or becoming persona non grata because we may have stood on a stage with someone who has their own baggage from an age where things were pretty different – and many young activists now involved were still in primary school. How many more young, new political voices – who do not tie themselves to this drama – are going to be suppressed with unfair castigation? Accusations, fallouts, grudges, dramas and previous controversies are plaguing this entire movement. It is hindering any collective progress and forcing new faces into forming tired old alliances and choosing sides. Before you kick the political bucket and retire into a space where you can continue bickering amongst yourselves – can you think about the damage that you all may be doing, and the cliques – built on your infighting – that may be carried over onto the next band of activists? You claim that a movement has been destroyed once before – do you ever consider that the regurgitation of the past will lead to the internal division and downfall of this movement? We do not want your history affecting our future. We’ll create our own drama, we’ll most likely fight amongst ourselves: but we’ll learn from you. People like us, with radical left wing views; an agenda, drive and true passion for change, are already struggling. There is no strong, viable Left option; thus many have fallen into the Scottish National Party in the hope that it can be shaped, and dragged further Left, from within. This, however, is beginning to seem like a pipe dream – and this is why it is so important that we attempt to find cohesion and organise into a force that can ensure that the SNP’s sudden Left turn is sincere and consistent. Only a strong, intrinsic left wing force can hold the SNP to account. But how can this be achieved when our arena is still so factionalised? We, the new faces, represent the future – and we want to make a shot of it. We want to continue to build and shape this movement: but we should be careful not to personalise it. It is not about any individual and it is not about any political party or organisation; it belongs to the people – but it is fatal to live in the past. I’m sure many good people with good intentions took part in the rally. Unfortunately your decision as organisers to involve Tommy Sheridan immediately prevents many from participating because he is dangerous and he has harmed them. Whatever people’s intentions, supporting in him in having such a massive profile contributes to the rehabilitation effort of a dangerous, lying, abusive criminal. That’s the issue here. If you take the decision to support him after what he’s done then there are consequences. I urge you to consider the viewpoints of some of those critics you are so keen to dismiss before doing so again. Dangerous people? Blair, Cameron, Clegg, Murphy et al. Focus your bile on them. No Jack, not “many”, just 3 representatives from different groups who did not respond to formal invites for whatever reason, but using words like “dangerous” and “harmed them” obviously suits your agenda. No, the issue here is the damage that a small group of haters are doing by spreading their venom and continuing their witch hunt which is affecting good, innocent people. The movement doesn’t need protection from TS, if it wasn’t for TS there would be no Hope Over Fear movement. To suggest that the movement needs protecting from someone who has been nothing but kind, caring and supportive of individuals and the cause is quite frankly ridiculous. Have you actually read and absorbed what these young guys are saying in this article, as they are calling out to the likes of you. For the sake of our country, please take their concerns into consideration. What do you think my agenda is? To attack socialists whilst saying nothing about the real enemy. So, Jack, the eternal bogey man continues to haunt you. As illustrated amply by the article, Tommy Sheridan is an individual who can be supported or challenged effectively either way. You are quite at liberty to challenge Mr Sheridan at all points and I’m sure you will be diligent in doing so. There are many like you who will be only too willing to assist you, and so I’m sure you’ll be able to successfully neutralise the Sheridan effect/bandwagon/circus whatever you care to label it. I am no particular fan of Mr Sheridan but the article hits its’ target well; the Left (not only in Scotland, but throughout these islands) has historically been rife with cliques and schisms. Personally, I’m sick and tired of it. Indeed, it was the reason why I withdrew from active political life for many years. The Independence campaign and movement sparked my enthusiasm once again, as it did for many other Scots and I fully agree with the writers of this article that this movement cannot be dragged back down into the quagmire of Left in-fighting. You have a right – indeed a duty – to challenge wrong-doing wherever and whenever you encounter it. Good luck in your efforts to curb Mr Sheridan, but for goodness sake I appeal to you to not be doing it in such a public fashion. What would you suggest is the best way to protect the movement from Sheridan then? ‘in a public fashion’? This and McAlpine’s defence are hardly very private…! I will not go to any event which formally includes Sheridan. The man is not only a misogynist, he is also a liability. You have have an inclusive movement or you can have Sheridan, but you cannot have both. I would urge the committee of Hope over Fear to reconsider whether they really wish to be associated with Sheridan. “You can have an inclusive movement, or Sheridan, you can’t have both”. Irony bypass, Mhairi? “I will not go to any event which formally includes Sheridan. The man is not only a misogynist, he is also a liability”. Nearly 100 people from all walks of life shared the stage with TS, you missed a fantastic day of live acts and inspirational speakers! “You have have an inclusive movement or you can have Sheridan, but you cannot have both”. Really, why can’t we have both? You are also suggesting that we EXCLUDE people, that’s not inclusive is it? I am a member of the committee, and it was the wider committee that encouraged and wanted to be associated with TS. Why would we “reconsider” our association with TS when he has been an absolute asset to us all? One cannot be inclusive if it excludes the other. This is a matter of logic. If Sheridan wanted to turn up to be part of the crowd at an event I have no way of stopping him, but him being on the platform or having a prominent role is stopping me and many, many others – particularly women from participating in any capacity because we refuse to give any form of credence to that misogynist. So you are, indeed, exclusive. The first person to reply to this article just proves the author/s valid points. Well done Jack. All that the comments or Robin McAlpine’s earlier piece prove is that there will never be a unified movement with Sheridan involved. Involving Tommy Sheridan automatically excludes those of us who have any concern about the welfare of the people – and in particular women – who have been so very badly treated by him, including folk I know. His behaviour is sexist, misogynistic and completely unacceptable. He shows no remorse for anything he has said or done in this regard. May I ask: had his behaviour been characterised as racist rather than sexist, would you still be so happy to have him involved? Would that kind of abusive behaviour be acceptable to you? If not, why not? And if it would be, where DO you draw the line? Or don’t you think a line needs to be drawn? To speak of “an age where things were pretty different” is a nonsense: what was sexism, misogyny and lies then is still sexism, misogyny and lies today. A refusal by Sheridan to show any remorse is at the root of many people’s avoidance of him. Your defence (or the patronising nonsense from McAlpine a few days ago saying it was all about class) is simply a way to excuse a misogynist who has single-handedly, through his lies and manipulation, done more damage to the Scottish left than any of us who refuse to now engage with him. Nobody is asking for angels who never make a mistake. But to excuse behaviour that he has never even pretended to acknowledge was harmful is to communicate that it’s ok to be abusive and tell lies. I went down, found out Sheridan was on the platform, and left. I wasn’t able to attend this event, but I abhor the very idea that left-leaning people of independent/independence mind should be precluded. I personally have little thought or regard for TS, but in large measure these are functions of his conscience, the law, and his willingness to speak up for this vital matter, at this important time, for our people and our country. Taking steps to marginalise anyone on the left on this matter is a bank holiday exercise in repeatedly firing a gun, in your back yard, and shooting off every toe on both feet then expecting to walk to political and social victory. Are we REALLY so asured of victory against those huge forces ranged against us that we can allow any such cracks to go untreated with the ever present risk of splinter into complete debris, as so many left movements have done before. Have we learned nothing?……and do I REALLY have to love everyone standing beside me at such events? ?…..are those I wouldn’t wish to buy a pint not also entitled to contribute positively to our children’s future??? What about solidarity with those equally of Left leaning, independent minds that were used and abused by Sheridan and pressurised to commit perjury to save his skin. No remorse, no apologies, no thought for others, or the damage to the SSP, or the cause. I am amazed by the number of lefties blind to the real injustice. How do we treat the cracks? Pretend they don’t exist? Thanks to the writers of this article for clarifying the background to Hope Over Fear. Having read the torrent of bile that flows from Tommy Sheridan’s former colleagues, i appreciate the courage it must have taken to speak out. Robin MacAlpine has also been very brave in supporting your rally and writing about it in Bella Caledonia. Left wing groups do suffer from the tendency to split into ever smaller shards. I think it is because they are motivated by ideology rather than the single minded quest for power which the right wing always unites around. There may also be a good helping of agent provocateurs poisoning the well. As an outsider, unconnected with the squabbling brothers and sisters in Glasgow left wing politics, I can only speculate. It is a pity that they feel so angry about this one individual. Had it been Tony Blair, George Bush or Gordon Brown I would understand. In other words, you weren’t there, don’t know what you’re talking about and how dangerous Sheridan is, and dismiss anyone who actually does know what they’re talking about? You are cheeky and rude, and not a democrat, your brand of supposedly left politics is akin to soviet show trials and gulags. Is the High Court Soviet now? Birmingham 6, Guilford 4? Yeah, the courts are always fair and unbiased, Jack. So we can just ignore misogyny? Ignore the hurt he has caused many and has never apologised for? Why is anyone indulging this nonsense? Women don’t matter it seems! We should know our place, get to the back of the bus and let the important men get on with business. Because if you have Sheridan involved many women will not be. Out of all the people HoF could have asked to compare, it chooses Sheridan? Why? What is his role? I would like more transparency from this group. It seems Sheridan sells HoF merchandise on his Solidarity site, there are constant links on FB between sheridan, Solidarity and HoF. This confusing picture does not help people to clearly understand what his role is and whether they, by attending or taking part, are colluding in allowing Sheridan to cause more harm. Excellent article. I congratulate you both on it and your inclusiveness. Too many people in this movement see TS as the enemy when they never utter a word against the real enemy, the Tories and their Labour counterparts. You haven’t uttered a word on this post about fighting the real enemy. Focus your copious bile on Blair, Cameron, Clegg and Murphy et al. What about the misogyny inherent in unionist politics. Where are you criticising that? Certainly nothing you’ve written here. The thread isn’t about them. On other places online, or elsewhere on Bella, or if you know me in real life, you can see how much time I spend on fighting governments, politicians, managements and exploiters in the places where I’ve been active. I don’t feel like I need to justify myself to you, but you’re wrong if you think that. Just as you’re wrong about all the good people of the SSP who Sheridan branded liars and scabs, and who people who believe his bizarre conspiracy theory accuse of having “egos” or “agendas” without any knowledge of they have done in the world. I just also include Sheridan in the list of many politicians who turn out to be in it for what they can get out of others. Jack, I have no idea who you are as you hide your bile behind a pseudonym. Latterly, also in the referendum campaign and god knows how many other protests. I do not worship at the altar of TS. He, alongside many others, has huge faults. But what I see of you is an anonymised bile spouting keyboard warrior. Whilst my personal knowledge of TS is of someone (undoubtedly with a huge ego) who has stood beside me and others over the last 30 years campaigning against the real enemies. Save your bile for the Tories. …….and yet a compere is chosen who many in the independence movement refuse to work with because of his damaging and destructive behaviour. Absolute twaddle Davy! When people were invited it wasn’t known who the compere would be. No offense intended towards TS but he wasn’t our first choice, but unfortunately several of our choices had other commitments. There was a very tight schedule and it needed experience to keep within our time limits etc and he done an excellent job on the day with the assistance of the Indy Girls. What a mess, no wonder people are turning to the SNP rather than the ‘left’. Grow up, find a workable solution or accept that you are about to blow the best opportunity since 1945 to establish genuinely popular left wing politics in Scotland. I despair, I realy do. Always ready to shoot ourselves down rather than fight for real influence. Come on. I wonder, if George Galloway had come down pro-independence rather than anti, would you be using the same arguments to defend him headlining rallies? Is Tommy Sheridan in the Judean People’s Front or the People’s Front of Judea? Your right Jack, most people you are attempting to poison against Hope Over Fear and Tommy Sheridan”weren’t here”. Your comment does though, lead me to assume that you are indeed the Jack Ferguson who was there. The same Jack Ferguson who admmited in court that you along with other ssp members, had left a voice msg on Tommy Sheridans phone telling him you “wished his mother Alice would die from cancer”, while as you very well knew, she was receiving cancer treatment. Are you and your ilk who continue to regurgitate the same spurious bile the type of people to unite the working class? Time will tell. Wink Wink! Right person, but I’ve never admitted any such thing because I didn’t do it. The court transcript tells a different story. You even tried to justify it by saying “it was just a joke! Could you answer my question please. Oh, forgot to say, I was also there and heard the call that you admitted to. Your mistaken, or deliberately misrepresenting. The court transcript would show that I admitted no such thing. He says my phone was used to send him an abusive message. My response is if that happened then it’s deplorable and I’m against anyone receiving anything abusive. Go check again. A very strange response, to my ears, Jack. Was your phone indeed used to send him an abusive message? Was it you who sent it? You say you are against anyone receiving abusive messages, but you don’t tell us whether you are also against *sending* them yourself. Shows ya: divide and conquer tactics are alive and well. As to the answer to your question. I’m not seeking to lead anything or unite anyone under my banner. I’m a student in another country getting on with my own life. I don’t have an ilk, I represent myself in what I have to say and nobody else. All I have to contribute are experiences, knowledge and opinions. How can you take from the hundreds of posts back and forth on these two articles that Tommy is capable of uniting anything at this point? Jack, nobody has said he’s capable of uniting the left. What I am saying is that he has a right to speak and I would happily attend an event with him speaking. It seems that the abuse you’ve accused TS of is a reflection of your own nasty brand of personal antics. Independent readers will make their own judgement on your phone being used to attack TS’s sick mother. I would say that TS seems to be much better than you are at uniting Jack. Therefore, may I humbly suggest that you henceforth desist. You could feel the personal agenda throughout all his posts. Tommy Sheidan, has done more for the people in Glasgow , than Labour who you have let away with murder for year. Who stood up for the poll Tax, Tommy. Just remember there is two sides to every story, other people on the other side were not Snow White either. So back off, I am sure you have all done things you are not proud off. But your wrong doing wasn’t made public. Let he who is without sin cast the first stone, until you see it happening in front of your eyes then how do you know anyone is guilty, know you don’t , you all just like to pass judgment on hear say. Well Tommy you will do for me, I take people as I find them and have never judged Tommy, he does the best for the people of Scotland. Tommy I wish you well and hope you prove your gossips wrong. The rogue in our midst is the British state/establishment and its many centurions littered throughout Scottish life. Few, if any, have stood up to our colonial masters better than TS. Tommy is the left-wing equivalent of evo stik Murphy. To all of those of you berating Tommy Sheridan, have you ever actually sat in on one of his meetings ? Were you present at the “SIEZE THE DAY RALLY” in Glasgow. Tommy is a socialist through and through and he is sold out for the people. He does not support corrupt Westminster and The House of Lords, the greedy bankers or the corporate tax evaders who syphon off the money into offshore bank accounts to avoid paying taxes. he does not support the Establishment and the dictatorship of Westminster. He is totally against spending £100 billion pounds on the renewal of Trident and the immoral weapons of mass destruction. He wants land reform in Scotland. he is looking for investment in people and jobs, affordable house building, regulation on extortion by greedy landlords charging excessive rents and does not support welfare cuts and austerity but is looking for investment and growth. I was at the rally last Saturday and it was exciting and invigorating, I also attended one of his Anti Austerity meetings in Buckhaven last night and the hall was packed and Tommy got a standing ovation at the end of his talk. No one is perfect but I can tell you one thing and that is that Tommy Sheridan does not aim for the bull and hit the wall, he is spot on with his policies and also by leading the Hope Over Fear Campaign and he has worked tirelessly in both the Referendum and the Election campaigns for the best for Scotland. for the betterment and advancement of Scotland by calling on Scotland to LEND THEIR VOTES TO THE SNP. The title of this piece is the ‘how the past is affecting the future’, when actually it’s the future that doesn’t want to be held back by the past by having Sheridan involved in any new United left movement. Cat Boyd from RIC made it very clear; Sheridan is the past, he should move on. He is divisive and hurt too many people. So if the Scottish left wants to move forward, then it’s without Sheridan. We can then have a more inclusive and democratic movement. One that doesn’t look to a misogynist and liar to lead them. Sharon, you want an inclusivity that excludes? No, that’s what you are advocating. Jim Bennett, I want a movement that excludes liars and misogynists yes. I wouldn’t want to be part of a movement that welcomed racists either. Or do you advocate the left should welcome them also in the name of inclusivity? There will be a new left that will not include Sheridan, open and democratic.Live with it. Those days are gone. Sharon, you want a movement that excludes liars?……You ever told a lie, Sharon? So Jim Bennett, I assume you think it’s okay for your political reps to lie to you? Really? I thought we wanted progressive politics in Scotland. Obviously some of us value integrity more than others. I wish you every success with your efforts. Do not be deterred. Scotland needs a credible socialist movement. The broader based the better. There is real desire for a more equal and socialist based society. After the Indyref and in the context of our continuing political renewal, it is incumbent on all involved to reappraise there former positions and coalesce with the new politic of a resurgent Scotland. There is a real chance of both community based socialist politics and representation in the Parliament and councils across Scotland. Let’s defeat the old adage – the left will defeat itself. grow up the lot of you or you will find the Greens and SNP will take your potential members / activists / voters – the far left had a chance with SSP and blew it. They are getting a second chance with the indyref / yes alliance scenario , but if you don’t stop squabbling you will blow it again and continue to be an irrelevance to the majority of people in Scotland when you should be having an impact on their behalf. In my utopian world and for the greater good, I would include everyone who is actively participating to secure a better future for Scotland. Let’s look at the bigger picture here and get as many SNP MP’s into Westminster then take the next step towards Independence. We are not dancing with the devil here unless you take his hand. Heartily agree with fermerfaefife. That’ll be me ostracised and treated like a pariah, then. While the Left is divided working class people, our poor, our sick and our disabled folk not to mention our children are let down and betrayed. You really, I mean really have to get over the politics of personal vendettas. It’s the message that matters not who speaks to it. And definitely, yes. The Left is the instrument of our own oppression. For the love of the oppressed: PLEASE stop it and move on! Not clear why you think that because Sheridan is not part of a new left, that the left is therefore divided. The organisations that will take the left forward have no place for Sheridan for all the reasons that have been detailed. One person, move on. Do you honestly believe that we can’t have a left in Scotland without a criminal and misogynist at its heart? I have met and listened to the very articulate and strong women on the left who will take this movement forward. Why should they be expected to welcome a misogynist into their midst, for the sake of this mythical ‘unity’ that apparently can’t happen unless Sheridan is involved!? You know the same Sheridan who wrecked the strongest left political party Scotland ever had. I am getting sick of being told to #shushforindy especially from people who have no idea of the damage he caused. I do not accept your premise and neither do many others. It’s your way or the highway, I see. Well, it won’t wash. It will continue to damage the entire Left and give ammunition and succour to our enemies on the right and the mass media. I stand by what I have said and that’s my final word on this profoundly depressing and bitter squabble. What don’t you accept about the premise John? Do you think Tommy hasn’t done the things people say? Do you think they were OK? Basically it comes down to if you think it’s OK to humiliate people you’ve slept with in High Court cross-examination, in pursuit of a lie. There’s absolutely nothing left wing about that, and a left that accepts it isn’t worth the name. Can’t agree here. Plenty of people have claimed to be socialist or left wing while turning out to be selfish liars and agents of further oppression within the very structures that are meant to be liberating, from Stalin to Tony Blair. A good message is not enough, we need people with some integrity and at the very least the humility and decency to admit to their mistakes. Everyone is human and has flaws, but not all of us take our lives in to court, and systematically trash the lies of others, to conceal those flaws. Come off it now. I and anyone else that knows the work you do against discrimination can have nothing but respect for you. But here you seem unable to put yourself in the shoes of the people, particularly women, who have had their lives savaged in unprovoked attacks by Tommy Sheridan, both inside and outside court. Whatever your opinion you’re my comrade, I wonder if you can say the same for me? Whatever your opinion you’re my comrade too, Jack. Emphatically yes. As far as I remember TS went to jail for all his sins that he stands accused of. Obviously on the far left there is no such thing as forgiveness. Many people don’t like him, but when I saw him speaking during the REF I saw an inspirational figure who galvanised many working class people into registering and voting. Add into that fact the one that during the Poll Tax revolt, he was prepared to go to jail and has done so in regard to challenging Trident. Most people would not be prepared to do so. I have no idea how misogynistic he is, but if he is, does that condemn him to eternal isolation? I wonder how moral and flawless his detractors on here are? ‘Jack’ studies in another country…which one? Funny how once the battle has started people like you start popping up and attacking and dividing the common cause. The far left in the UK has long been infiltrated by spies and fifth columnists, that’s why it collapsed. I suggest you lot go away and form a the ‘Anti Reactionary Sheridan Entryist Society or ARSES for short. He didn’t go to jail for destroying the left. Nor did he go to jail for taking people he had slept with to court and publicly humiliating them. He went to prison because he lied in court, and the courts don’t like have the blatant pish ripped out them quite so much. The problem that remains however is that he still comically protests his innocence, and spreads a bizarre conspiracy theory laden with false allegations, continuing to damage the lives of those he has been hurting for over a decade now. When he stops doing that, and actually seeks the forgiveness of people he now pretends are spies or agents of Rupert Murdoch or members of the Illuminati or whatever it is, then we can all move on. Until then, no, him going to jail has not solved any of the underlying issues. Plenty of other people have been to jail for their consciences, and against Trident. Including some of the people who Tommy has so profoundly defamed over the years with his lies. FFS, no comment. Other than that the first part of the sentence even further disqualifies the second part. “I wonder how moral and flawless his detractors on here are? ‘Jack’ studies in another country…which one? Let me say it for the avoidance of doubt. I am not perfect, I have flaws and make mistakes in life. Everyone does and we can accept that. The difference is I never went to court to lie and try and conceal my flaws. Tommy took his whole life into court and ultimately didn’t like the results – just as his real friends told him would happen. I study in the Netherlands now – see my article elsewhere on Bella about the student struggles going on at my University. The way I have been treated by Tommy Sheridan and his supporters down the years is a big part of why I no longer felt safe in my own home country, and had to come over here to continue my studies. I’ve been around though, having spent half my life involved in the Scottish left in one way or another. So if you think I’m a spy I’d suggest you’re deluded. I’m sure MI5 has better things to do with it’s time than be taking part in this comments thread. Jack I feel for you. I have a friend who also had to move country also because she was spat at and verbally abused by Sheridan supporters. No one will have any sympathy for her. Because the ‘man’ and his ego is what matters. It’s absolutely appalling that people try to justify this type of politics in Scotland. A Scotland that we are trying to change and ensure that we all have a voice, not just those who shout the loudest. I think it is time for HoF to come clean about the type of organisation it is, how it is funded and TS’s role. Because I don’t want us sleep walking into the same politics we have had before. But I don’t suppose they will. He has never apologised to those he harmed. He has never admitted that he destroyed a left party to protect his image and his career. What I don’t understand from Sheridan apologists- do they think this is okay? Is misogyny okay, is lying okay to protect your family man, and man of the people image, even if it damages women, wrecks lives and a movement? Is someone’s ego worth all that? Answer those questions first and then come back and tell the rest of us, who want to rid politics of the same old lying egotistical rubbish, that we are wrong. So Lochside if he is only a wee bit misogynistc, that’s fine? Really? Just like it’s okay to be a wee bit racist or wee bit anti Semitic. Good grief! You keep cheering as a fanboy/girl Sheridinista. But he is not the future ( thankfully) he is the past. It should matter what those who seek to represent us do. Is it okay to lie, to drag your comrades through court, and seek to do so again. And for what? Those people have contributed more to both the Indy movement and left politics than TS ever did. Why aren’t you on side with them if you don’t like division? TS is a dinosaur. And he’s not a socialist through and through. If he was he wouldn’t be a misogynist. If you think it’s just Sheridan that’s the problem, you are wrong. If you support misogyny & abuse by welcoming the perpetrators of it (not just Tommy btw) you are perpetuating the worlds oldest prejudice, the only direction you are progressing in is backwards. Blind loyalty dependent on “number of demos attended” hero worship is ridiculous. Folks used to worship Savile for all the charity work, look how that turned out. I understand you are both young and naive, and I hope that you break free of the old left that is full of stagnant pale stale males. I hope the organisers of Hope Over Fear realise by including Sheridan they are excluding feminists and people affected by his abuse. Doesn’t seen very progressive to me. We’re fighting for a better world and abusive mysogynist people are NOT welcome in our movement. If you don’t understand that then you need to question what kind of a society you’re fighting for. So the people who are dictating to the people, who should be included in this new world, makes it alright. I would say to that , they are know better than Tommy or anyone else. My worry is if the people can not forgive anyone when they make a mistake, there is something very wrong. Forgiveness is a great gift, there has been well known people out there who have done much worse things than Tommy. So may be the people you are speaking about ( people are not welcome in our movement) that statement Sayers it all, a dictatorship. I think a lot of people will not want to be a part of the new dictatorship world. Live and let live. Not anyone of you are God.